Mosaic is a craft achievable by complete beginners. Essentially, it is painting by-numbers but with pieces of glass or ceramic, known as tesserae, instead of paint. The skill lies in combining colors together in a pleasing way, and in producing a representative pictorial image. To start with, draw simple stylized shapes freehand or mark out geometric patterns on a plywood base, then fill in the designs with colored tesserae. 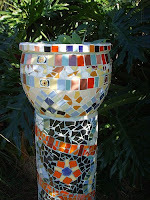 Fragments of plain and patterned broken tile have been incorporated into the design of these mosaic plant pots. Collect your materials by looking in junk shops for old china in contrasting and complementary patterns. 1. If the pots are not frost-resistant and they are intended for outdoor use, treat inside out by sealing with a coat of diluted PVA glue. Allow to dry. Paint the inside of all the pots with acrylic paint in your chosen color. Leave to dry. Using chalk or wax crayon, roughly sketch out the design for the pieces. 2. Snip small pieces of ceramic tile to fit within your chosen design. Using a flexible knife, spread the adhesive on to small areas of the design at a time. Press the tile pieces in place, working on the outlines first, and then filling in the background. 3. Mix powdered grout with water and a little cement dye. Spread the grout over the pot, filling all the cracks between the tile pieces. Allow the surface to dry thoroughly. 4. Brush off any excess with a nail brush. Allow to dry thoroughly for at least 48 hours and then polish with a dry, soft cloth. This is a cool idea, very interesting.